Readers, I feel like I’ve made it big. My article about depression is live on The Broad Side. This piece is groundbreaking for me. I published under my own name, not my Daisy moniker. I took a few posts from my major depression of 2011 and pulled them together to form a coherent whole. I had posts from the beginning, the middle, and the end (my recovery), so I found a representative piece from each time period. This took courage, my friends. If I’m really going to make headway in breaking the stigma attached to mental illness, I needed to use my own name in discussing my depression. Please take a deep breath and click over the The Broad Side. When you’re finished with my piece, feel free to stay a while and peruse other articles. If you enjoy reading me, you’ll find a lot to like on The Broad Side. Here it is. Read it slowly and thoughtfully, please. Remember, it took courage. The flurry of posts and memorials for Robin William’s death has subsided a little. Life goes on and on. Meanwhile, I keep going to the Farmers’ Markets. The act of going & the act of buying followed by the process of preparing and freezing or canning or cooking… Let’s start over before I create a huge run on sentence. 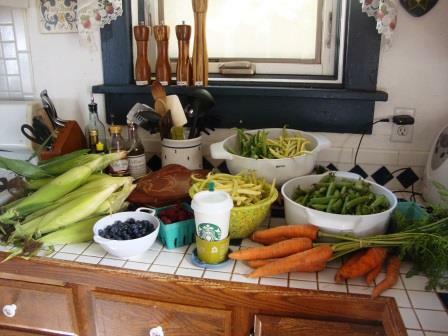 The act of going to the market is therapeutic. I get to talk to people, ask questions, and interact positively. The midweek market is a place filled with happy people! If you look closely at the photo, you’ll see two bunches of carrots. A vendor gave me the second bunch for free because I bought peas and beans from him. He was just being generous and nice – he didn’t know I had a pet rabbit at home waiting for fresh food like this. 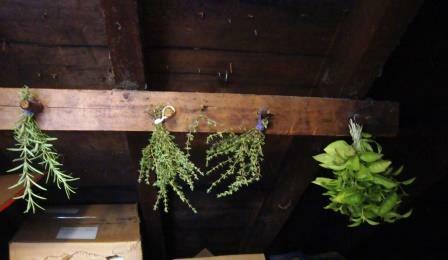 Rosemary, Thyme, and Lemon Basil hang in the attic. They’ll hang from those hooks for at least two weeks until they’re dry or pretty darn close to it. Like gardening, hanging herbs for drying demonstrates a belief in the future. They won’t dry overnight. Like gardening, drying my own herbs is a process, not a product. So on we go, growing and harvesting and gathering what we’ll need for the future. The future looks good. 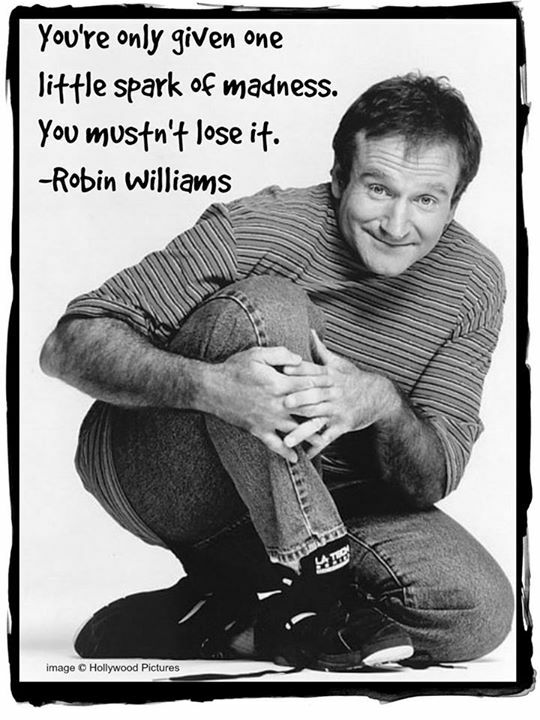 Tributes to the great Robin Williams are all over the Interwebs and all over the world. Erika Diamond reprinted a post I contributed a few years ago. Anything I add will echo something said by others – and perhaps that’s one of the reasons so many are speaking up. From a college friend – Celebrity deaths don’t generally make me cry. I just sobbed over the loss of Robin Williams. From a teacher and techie friend – I have to turn off Facebook and all social media tonight. This repeating story of Robin Williams being so alone and desolate is absolutely killing me. Iphigenia Doubtfire. How much of this was scripted and how much improvised? We may never know. 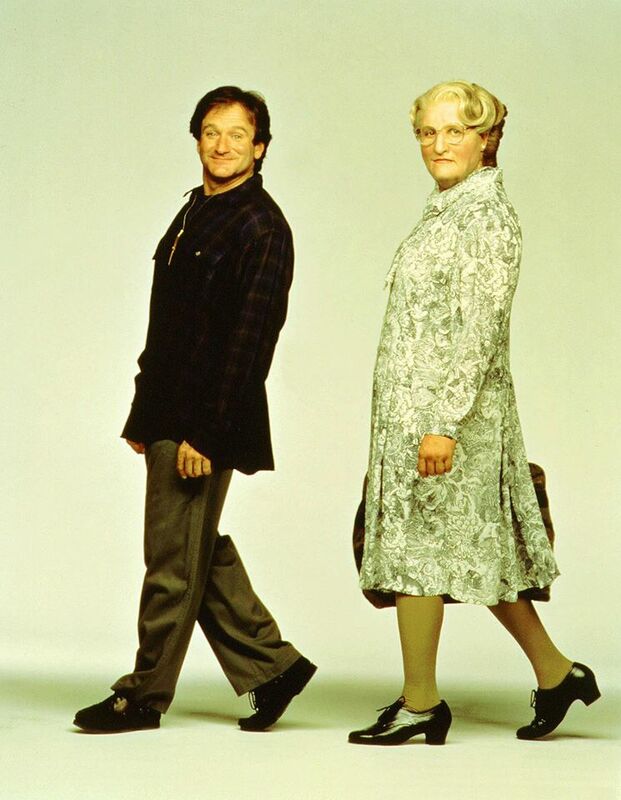 Robin Williams in character within a character – both characters lovable and delightful people. That spark of “madness” – creativity, excitement, humor, brilliance. When I think of Robin Williams and his collective works – I haven’t even seen them all! – I keep coming back to brilliance. But within that brilliant man was a tortured soul. Depression, an illness made worse by addiction. Yes, I said illness. Depression is an illness that causes great pain. When people experience clinical depression, they are not sad or weak or wimpy. They truly cannot function because of their pain. Recovery can be slow, and it can require medications and therapy and more. Robin’s legacy includes the manner of his death, but I hope his life is what we remember most. He was a very unique, strong and talented man; a diagnosis of mental illness doesn’t change that. Rest in peace, Robin Williams. May you finally find the peace you were seeking. You made the world a better place. Dear world; again? So soon? I’m sure she meant it in the best possible way. I won’t assume anything, but I’ll guess that the RN in charge of messaging didn’t mean to use a commonly known text-message and IM abbreviation. She must have been unaware that there could be another interpretation. So, dear clinic, you still might want to train your personnel to be more careful with their shortcuts, lest they tell an already frustrated patient to do this. Forcing someone with a severe depression to wait seven months for psychiatric care is a bad idea. Assigning a teacher (a field known for less-than-flexible schedules) to a psychiatric nurse practitioner who doesn’t see patients after 3:00 p.m., well, is yet another poorly considered idea. So think about it, clinic, oh you-who-claim-2B-efficient. A seven month wait? A medical professional with office hours that force the patient to take time off from work every single time? Efficient? Not for the patient. Readers, I gave up on the psychiatric care. My family physician has done well treating my depression, as well as or better than the one-who-was-not-worth-the wait. I know from past experience that I need to put myself first. In the real world of employment, however, I need to balance my doctor time with my work time. I love my work and my job, too. I’d like to stay employed there. My supervisors would like me to remain employed there, too. I guess it would be more efficient on my end to remember that laughter is the best medicine. The next time an RN writes “f/u” in a message, I’ll just respond by ROTFLMAO. Right? Right. Dear Pharmacy; your carbon footprint stinks. If just 25% of U.S. families used 10 fewer plastic bags a month, we would save over 2.5 billion bags a year. * So tell me; why do you have such a problem with my bringing my own bag? Last time I had to tell the clerk twice, loudly and clearly, before she looked at me with a confused expression and then set the plastic bag down. I guess I’ll take the confused expression over the eye roll I’ve gotten several other times. Well, dear Pharmacy, let’s look at another wasteful habit. Every single time a clerk hands out a (stupid little plastic) bag, it contains advertising. Flu shots, diabetes supplies, the smart phone app for refills – I don’t need these. Really. And when I hand back the paper with a “Thanks, but I’ve already had my flu shot,” the paper doesn’t go to another customer; it goes in the recycling. What the heck? Your carbon footprint approaches Paul Bunyan’s print in size. Pharmacy, dear, oh Ye Who Shall Not be Named, I just moved the bulk of my maintenance medications to another provider. I no longer plan to make multiple trips per month, tolerate the attitude, or accept the outrageous amount of waste generated. Got it? Oh. I didn’t think so. Never mind.